These easy bars make a good fall snack. 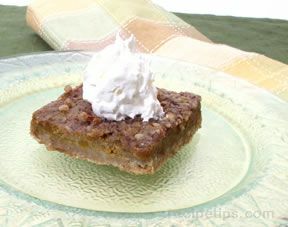 The pumpkin bars can be made anytime of the year but fall seems to be time when we all start to think about pumpkin recipes. It is also the time when we begin to think about carving all those pumpkins for Halloween. Combine crust ingredients until crumbly. Pat into a 9x13 ungreased pan. Bake crust for 20 minutes at 350° F.
Combine filling ingredients and beat well. Pour into baked crust. 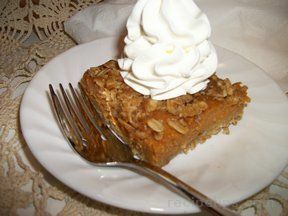 Bake 20 minutes at 350Âº F.
Combine topping ingredients, crumble and sprinkle on top of baked pie squares. Bake an additional 15 minutes or until set. 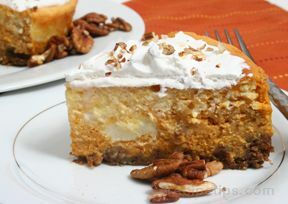 Optional: serve with a dollup of whipped topping.